There are many different ways of trading the financial instrument in the forex industry. In the eyes of trained professional there is no specific trading strategy in this world which can guarantee 100% profit from this industry. There are many traders who uses the important support and resistance level in the market and make a decent amount of profit in the market. It’s true that there are many different trading strategies in the market which can help you to make decent profit but as a professional trader, you need to develop your own trading strategy based on your personality. For instance if you prefer short time frame trading then swing trading won’t suits you since you have to wait a long period of time only take one trade entry. On the contrary, if you are long time frame trader then you can’t make a decent profit by using the shorter time frame. Based on your time frame trading strategy will extremely varies. But in this article we will teach you how to use the Bollinger band indicator in any time frame and profit consistently. There are many professional traders in the world who are making consistent profit simply by using the Bollinger band trading strategy. But before we jump into Bollinger band trading strategy we need to have a clear understanding about this indicator and how to use it. 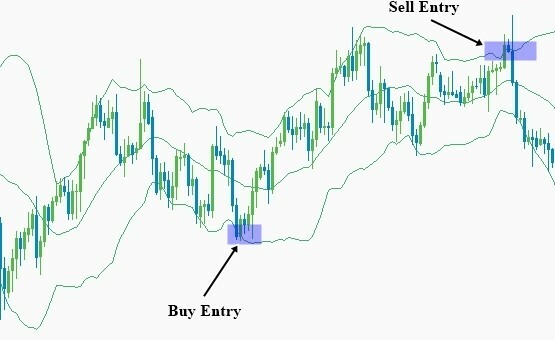 In the next section of this article, we will guide you step by step and help you to master the art of Bollinger band trading strategy. Bollinger band is one of the most popular indicators found in every trading platform. In the mt4 trading terminal, you can easily access to this indicator by clicking the indicator section available in the insert tab. Once you insert the indicator into your live chart you will see three different moving average forming a channel like structure in the chart. This is your Bollinger band indicator. The Bollinger band indicator has three different parts. The upper line of the band is known as the upper Bollinger band and the lower level of the band is known as lower Bollinger band. The mid part of the band is known is mid-level Bollinger band. The upper Bollinger band restricts the bullish move of the currency pair whereas the lower band act as the support level of the currency pair. Since you are now familiar with the Bollinger band indicator lets step into the next section and see how we can use these band in our real life trading. Let’s see how the professional traders use the Bollinger band indicator in real life trading. Figure: Trading the support and resistance level in the Bollinger. In the above figure, the blue shaded region is the place where the professional traders enters long and short in the market. Before you start using the Bollinger band indicator make sure that you know the prevailing trend in the market. If the prevailing trend is bearish then only look for selling opportunity in the upper level of the band. On the other hand, if the prevailing trend is bullish then look for buying opportunity in the market at the lower band of the indicator. In the above figure, the market was in rang movement that why traders took both buy and sell entry using the indicators. Once you master the art of simple Bollinger band trading strategy than move forward to the advanced Bollinger band trading technique. Professional Bollinger band traders uses the price action confirmation signal to trade the important band of the indicators. For instance if the price hit the upper level of the Bollinger band then they look for bearish price action confirmation signal to enter short into this pair. On the other hand, if the price hits the lower level of the Bollinger band indicator they wait for bullish price action confirmation signal to enter long into the currency pairs. Trading the upper and lower Bollinger band with price action confirmation signals allows the trader to use tight stop loss in the market and provides high excellent risk reward ratio in their live trade. But while using the advanced price action Bollinger band trading technique make sure that you are always trading in favor of the long term prevailing trend since most of the time price breaks the band in direction of the long term prevailing trend. But if the market exhibits sideways movement then you can also trade both the bands of the indicators.